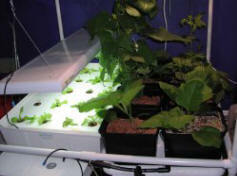 Is your hydroponics system sagging, disorganized, or hard to work with? *Cost cited does not include tray and reservoir pictured above. Our HydroPad® stand is the most functional, economical and versatile hydro stand out there! 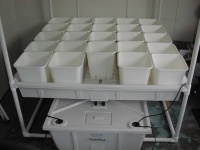 It was designed around the popular American Agritech 4x4 Flood Tray (see photo above) but will fit most other brands of flood trays. Versatile? You betcha! 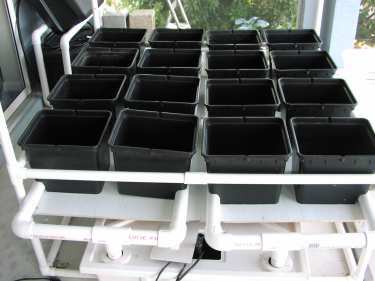 Set this PVC hydroponics stand up with a "split plan", half pots and half lettuce raft. Hang a T5 fluoro over your raft and an HID over some Batos. 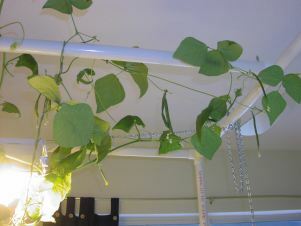 Or just hang one strong HPS over the entire 4X4' spread. (You might want to check out our combo lighting special at the bottom of the page). The combinations are limited only by your imagination! The HydroPad® stand provides not only a sturdy base of operations, it holds your grow lights at any height, and as high up as possible to allow optimal space for vining crops (no holes in your ceiling). It provides a strong framework for trellising or tying your plants UP for maximum production. We just love our stands and are proud of the clever design that allows it to be used for so many different hydroponics garden configurations. 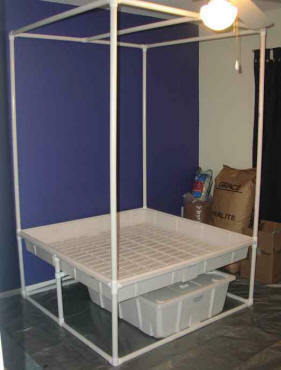 Your new hydroponics garden project deserves a proper launching pad.... why not build it a HydroPad® ? How can I get the plans? You can get a complete set of the blueprints for the Hydropad® stand by ordering our highly rated "Simon's Simple Hydroponic Plans" ebook. 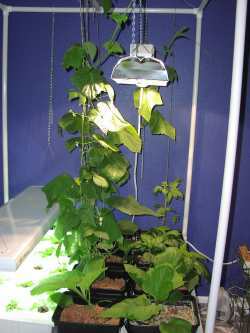 Not only will you get the plans and parts list for this awesome stand, the e-book also includes complete directions for 4 of the most prolific, user-friendly, and inexpensive do-it-yourself hydroponics systems out there. 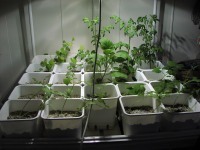 Read all about the ebook here: Hydroponic Plans. Trick out your new pad! Doll up your shiny new HydroPad® with our great HID lighting combo kit... for $199.00 INCLUDES SHIPPING! Includes both the Metal Halide and High Pressure Sodium bulbs for absolute maximum production. All this for under $200 delivered! You can't beat that for a combo light kit. [Sorry, we only ship the special offer HID Combo Light Kit to the lower 48 US states. Inquire about shipping rates to AK & HI].